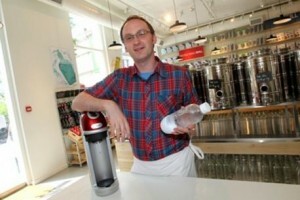 SodaStream has gone very quiet about its plan to open a chain of ‘eco-stores’ in the UK. Who burst their bubble? Back in the summer of 2012, SodaStream opened its first ‘EcoStream’ store in Brighton. SodaStream is an Israeli manufacturer of machines for making fizzy water at home. The store was marketed as ‘a filling station for the eco-aware’ – a place where green-minded Brightonians could get their bottles of cooking oil and washing up liquid refilled, and stock up on SodaStream products. The company chose Brighton as the location for its first UK eco-store because of the town’s reputed support for green initiatives and green politics. SodaStream’s plan was to follow the opening of the Brighton EcoStream store by rolling out similar so-called eco-stores across the UK – presumably in locations also considered to be sympathetic to the green image the company was projecting. The Brighton shop manager, Steve Bannatyne (pictured right), was quoted in the Brighton Argus soon after the shop opened, saying that “Brighton and Hove has been picked as the launch site for the first EcoStream store” (Brighton Argus, 09/08/2012, italics added). The flagship store in Brighton would soon be joined by lots of others. Trouble is – it hasn’t happened. Why not? SodaStream hadn’t done their homework. True, Brighton has something of a green tinge. But it also has one of the UK’s largest, most active and most committed group of campaigners for justice and human rights in Palestine. 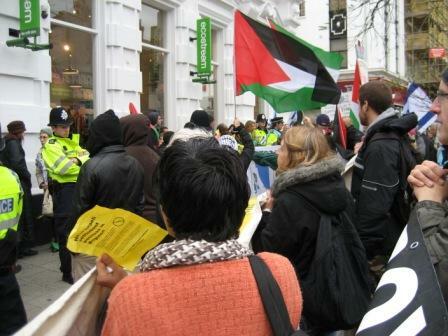 Shortly after the EcoStream shop opened, local activists started demonstrating and picketing outside the shop, urging fellow Brightonians to boycott the shop, and spreading the word about the true nature of SodaStream. These protests have continued several times a week for 16 months, and show every sign of continuing until such time as SodaStream packs up its eco-wares and vacates its so-called flagship store. Why? Because local activists and their many supporters strongly object to the presence of the store, due to SodaStream’s deep economic involvement with the Israeli programme of illegal settlement expansion in the occupied West Bank, and its documented complicity in ethnic cleansing and profiteering. SodaStream’s main factory is located in Mishor Adumim, an illegal Israeli settlement east of Jerusalem, and the company receives tax breaks and other inducements to operate in the settlement in an effort to make permanent Israel’s colonisation of the Palestinian West Bank. Details of the protests, and the reasons behind them, can be found elsewhere on this site. It is rare indeed to see anyone shopping at EcoStream. This is no doubt due in part to the fact that the boycott campaign is now very well known in the town. Brighton residents are not stupid – they can see complicity with human rights abuses when they see it, and want no part of it. The shop is haemorrhaging money, but the company seems content to keep it open, continually refilling its accounts with recycled cash, so as not to lose face. So, a year and a half after opening ‘the first EcoStream store in the UK’, what has happened to SodaStream’s expansionist dreams? SodaStream’s intention was that, by late 2013, the UK would be awash with eco-bubbles. The fact is that they still have only one shop, and it is taking a regular pounding. At the time of writing, there is nothing on the company’s website suggesting that the expansion plan is still alive. The probability is that they have radically but quietly revised their business plan, and have abandoned the expansion project due in large part to the noisy reception they have received in Brighton. And they must now realise that, wherever in the UK they try to open another shop, local pro-Palestinian activists will follow Brighton’s lead and make life difficult. In a sense this is a disappointing development, since we would prefer to inflict even more damage on this deeply unethical company. Opening up new fronts in the international campaign of Boycott, Divestment and Sanctions would be helpful, but this is still a huge win for the campaign!